Connections: Group members share a connection. Although you don’t have access to their extended networks for introductions, you’re considered directly connected to them, in that you can see their full profiles, and they can appear in your search results even if you aren’t within three degrees of everyone in the group. Your search results can include fellow group members as well as your first-degree connections and second-degree network members. Visibility: By joining several groups — particularly large, open ones — you can increase your visibility in the LinkedIn network without having to add thousands of contacts. Knowledge: LinkedIn Groups share information and expertise among their members through the Discussions and Promotions pages of the group, which you can benefit from as a group member. Because there are thousands of groups for most industries and fields, LinkedIn Groups can be a valuable source of knowledge. Recognition: Employers like to see that you are connected with professional groups because it shows the desire to expand your knowledge base, stay current in your industry or field, and be open and eager to network with like-minded people. Group logos: The logos of the groups you’re in are displayed on your profile. This is a sort of visual branding, reinforcing your association with those groups without a lot of words. 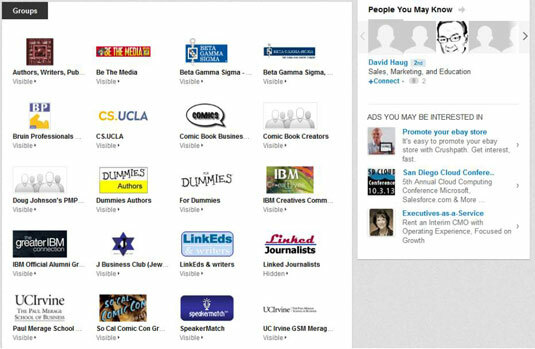 Some LinkedIn Groups are extensions of existing organizations, and others are created on LinkedIn by an individual as a way to identify and network with people who share a common interest. In either case, they’re useful tools for growing your network and leveraging your existing affiliations.